Soaring into the stratosphere before tumbling back down to earth, Straight Outta Compton could be called a team bio-pic. Set in the turbulent musical world of the late 1980s and early to mid 1990s, the movie purports to tell the true story of N.W.A., a group that exerted great influence on the popular culture of the period. 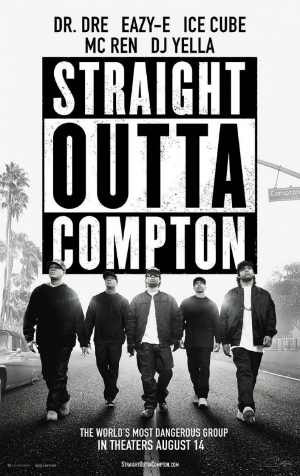 Primarily, it’s the story of three young men, known by their stage names: Eazy-E (Jason Mitchell), Ice Cube (O’Shea Jackson Jr.), and Dr. Dre (Corey Hawkins). The narrative beats fall easily into bio-pic rhythms, and while the telling occasionally becomes lacerating, more often it’s adulatory. This is, after all, an authorized biography, with the principals serving as executive producers, with the presumptive powers that come along with those positions. Director F. Gary Grey is a longtime collaborator with the real-life Ice Cube, having worked with him on 1995’s Friday, as well as a number of music videos. So the idea that the movie will present the unvarnished truth behind the polished official story should be stowed. Still, that doesn’t diminish the cumulative power of the first part of the movie, as the three heroes steadily coalesce into a roaring, collective blast of thunder. As the movie begins, Eazy-E has established himself in the drug trade with a steadily rising income and accompanying dead-eye stare; Ice Cube walks around with a notebook, scribbling down poetry that will be transformed into lyrics; and Dre alienates himself from his mother by his pursuit of musical beats as a disc jockey at a local club. Soon enough, Dre has convinced Eazy-E to invest some of his hard-earned cash into the production of their first record, and then pushed him into rapping, which he’s never done before. The immediate success of the record attracts the interest of an older white man named Jerry Heller (Paul Giamatti), who sells himself to E as manager and then insinuates himself into the tight structure of the group. The group expands to include other artists, including Dj Yella (Neil Brown Jr.) and MC Ren (Aldis Hodge), and then starts performing live, attracting a rabid fan base and a record deal. They pour their lives into the words and music — most notably a nasty episode in which local police officers assume they are gangsters and shove them to the ground — and when the record is released, it’s a sensation. They tour the country, stirring audiences and authorities nationwide. On the tour, however, the financial divide between Eazy-E (and Jerry) and the rest of the group becomes apparent, leading to Ice Cube’s departure and rivalries that plague the remainder of the running time. It’s also at this point that the narrative drive stalls, leveling off to focus more on a series of relatively petty financial matters and issues of control than on the larger societal pressures that everyone else in the country was experiencing. Even so, Straight Outta Compton remains a vital ride, full of spit and vinegar. Sure, various imperfections are polished up before the final credits roll, but that’s what happens when bio-pics are made by the people involved. The film opens today in theaters throughout Dallas.